Born into a privileged household, Potter was educated by governesses and grew up isolated from other children. 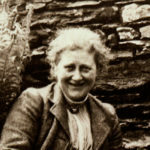 She had numerous pets and spent holidays in Scotland and the Lake District, developing a love of landscape, flora, and fauna, all of which she closely observed and painted. "All outward forms of religion are almost useless, and are the causes of endless strife. Believe there is a great power silently working all things for good, behave yourself and never mind the rest."